The Landscape Group has again added to its impressive collection of Etesia pedestrian mowers by recently purchasing a range of PRO 46 PBE push and PBTS self-propelled models. The mowers, which are specifically designed for commercial use, are ideal for any contractor. The Pro 46 mowing deck has a distinctive shape which produces a powerful suction and blowing effect ensuring a quality cut with maximum collection. With a 52 litre Xenoy grass box, all collections can be quickly emptied and cleaned with a hose. The Pro 46 rotary mowers are also lightweight and compact, making them ideal for mobile grass cutting units. No tools are required to fold the handlebars which makes transportation and storage extremely easy, and as an option, a PR46E mulching kit and PZ46M mulching blade convert Pro 46 mowers into formidable a mulcher. 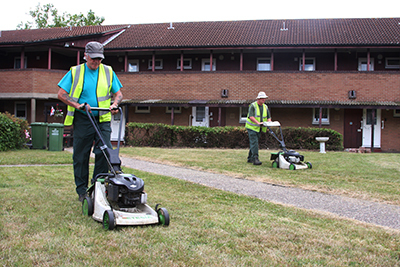 For nearly two decades, The Landscape Group, who are one of the UK’s leading suppliers of grounds maintenance services to the public sector, have turned to Etesia to use a variety of pedestrian and ride-on models to carry out its mowing operations on housing estates and verge work. Etesia mowers are renowned for being able to cut and collect in all weather – even the wet; which sees The Landscape Group being able to utilise them all year round – not just for grass collection but also for leaf collection in the autumn. “I choose to work with Etesia and their range of pedestrian and ride-on machines because they are not only reliable but extremely robust mowers. My experience with Etesia dealers is extremely good – they deliver the mowers on time and offer dedicated support. The only trouble is that it is rarely needed because nothing ever goes wrong with them”. The Landscape Group’s decision to use Etesia’s products is testament to the quality of the machines. With an ever growing customer base including many of the UK’s top councils, landscapers and groundsmen, Etesia is the number one choice for users due to their reliability and low maintenance. Angus was first attracted to the Etesia brand nearly twenty years ago by the ‘novelty’ of the Xenoy deck, something which Angus believed wouldn’t stand up to the rigours of the industry. “How wrong I was!” he admitted.